So I got some new toys. What, you’re not surprised? Yeah, neither am I.
I almost thought I gave up on 35mm film. I didn’t shoot a lot of it anymore, and granted, other than the Vivitar Ultra Wide & Slim it just didn’t do anything for me really. The Praktica BX20s is nice, and the Nikon N90s is a fancy and fast beast, but yeah, not that exciting. But I didn’t want to get up that easy. With a recent affinity for black and white film I started looking in a different direction, to the rangefinder cameras. Obviously the king of the hill is a Leica, but I really should start off easy, and work my way up. Maybe I’ll stop by a Bessa R4 on the way, but for now, let’s start with something about 40 years old, a Canon Canonet QL17. I shot some real cheapo film with it, and while the film itself is far from being a favorite, it only had 12 shots, perfect for shooting a test roll. I’ll have to work on the focussing, but this one turned out okay. It’s a cute little camera, and while it’s quite heavy, it sure comes in handy and is more compact than the Praktica, not to mention the Nikon. 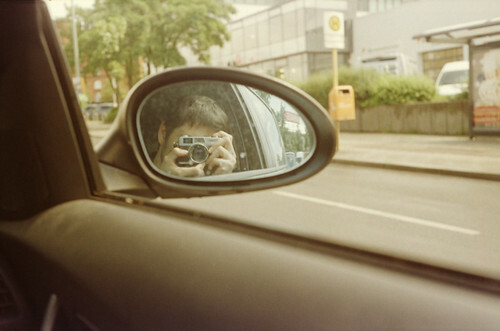 Sweet camera too, but yeah, rangefinder focussing is a different school. Not seeing what you get sure makes it more interesting. Boom, there’s the kicker, things got interesting again. But! Why not crank it down a notch? There’s another, a smaller infamous rangefinder camera, with a touch of lomo, though just a small one, and it’s a lot cheaper. It’s the Olympus XA, not the XA2, not the XA1, no, it’s the original. I got one off ebay, and I’m very much looking forward to trying it out. It also sports a rangefinder focus. I’m looking for something that I can take with me in my pocket, the Holga is cool and all, but something more general purpose for the every-day is what I’m looking for. So there, my explanation for the current state of my addiction. Last but not least, it’s the king (or the queen?) of the Polaroid cameras, a Polaroid 110B converted for pack film. Well, maybe it’s not royal, but it sure looks like it. Now, I can hear you say that doing the conversion yourself is a fulfilling experience, you should do it yourself, blah blah blah. Sure, I could, but I’m neither capable nor even remotely patient enough to pull that off. Believe me, it’s better that way, for all of us. I’d curse a lot, probably kill this blog, and my Flickr account too. Ebay once again to the rescue (if until now you haven’t realized that ebay is awesome to get old-ish cameras, there, I just said it), I scored the beauty above. A conversion sets you back around $500 on ebay US, and I got the 110B for a pretty good price. Apart from some focussing issues, this time it’s the camera not me (or is it? ), it’s an amazing beast. Sweet lens, fully manual, and huge! That’s right. Depeche Mode. The one band I’ve been stuck with for more than 20 years now. My sister got her first tape in East-Germany, an album with their greatest hits from around 1981 to 1986. That was my first contact with Depeche Mode, and I still like their music from back then. Crazy huh? 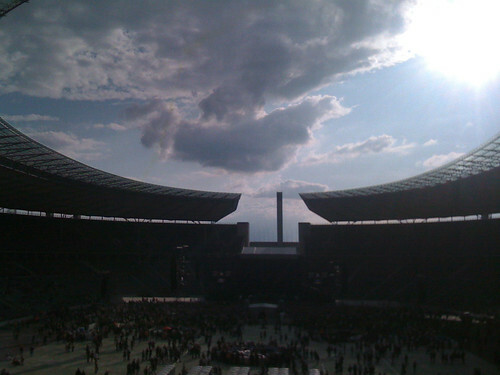 Last week we went to see them at Berlin’s Olympic Stadium, together with 60,000 other people. Yep, that’s a lot of people. It’s gotta be the biggest concert I’ve been to. Except for the supporting bands the show was awesome. I do prefer the show from three years ago, but it still was good to be there. We were reasonably close to the stage, only being annoyed by people desperately trying to get a photo or record video. Pro tip for you guys: Turn off the flash when you want to shoot a stage that’s 50 meters away. I only took one awful photo during the show, just to post it on Twitter. 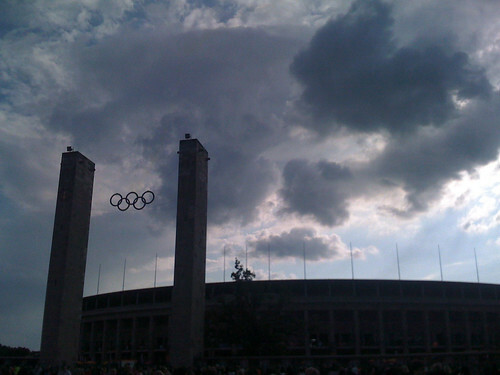 The other photos I took were of the awesome Olympic Stadium. My word, it’s awesome. It sure has a controversial history, but when you stand out- or inside of it, it sure looks quite impressive. I only had my iPhone with me, but here’s a preview. We’re sure to go back soon for a detailed photo tour. Luckily they’re open all week when no show or game is on, hoping for awesome clouds like these. 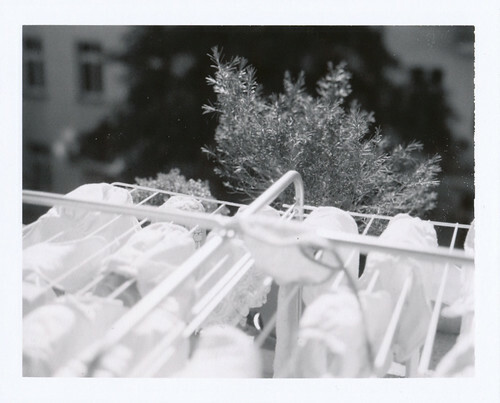 It’s probably no secret that I’m very fond of the Holga. Wait, isn’t the blog title even suggesting it? Right. Glad we straightened that out. Anyway, things are happening in the Holga world. The company making them recently started their own website. Can you believe it? It’s 2009, and some companies still don’t have websites! Apart from that, they’ve also been busy cranking out new Holga models, and boy are they awesome. The weirdest one is probably the Holga TLR, a twin-lens reflex Holga. How weird is that, some people don’t use the viewfinder at all, and now this. The Holgablog has some inside scoop on this beauty, but in general I don’t think it’s for me. The Holga is an extension of my eye, if you will. Call me a weirdo, but I even use its viewfinder, as far off and inaccurate it may be. My birthday’s coming up, by the way. Just saying. In other news, a while ago my good friend Marzena interviewed me on all things photography, coffee and cupcakes. If you haven’t already, head on over there and read it, I dare you! My personal stash of cameras has expanded over the last weeks, I just got a Canon Canonet QL17 (first roll still waiting for development, if it works nicely, I’ll keep stuffing black and white film in it), a Polaroid Automatic 355 (to replace my 101 which is on its way to Korea) and, ohmigawd, a Polaroid 110B, my oldest camera so far, and nicely converted for pack film already. I’m so looking forward to playing with that bad boy. I also discovered (thanks to Kai) what is probably the nerdiest film shop in Berlin, Foto Impex. I’ll see you there! Also, since about yesterday I can’t get this out of my head. While you’re at it, watch this as well. Metric is my band of the week.